On Friday I went to an exhibition entitled "Weaving God's Glory" at Romsey Abbey, which is not far from where I live, it showed the many vestments, altar frontals, kneelers and banners associated with the Abbey, most of these items were made locally by some very gifted needlewomen. Not having permission to put photographs of them on the internet I decided to take a photo of the altar frontal that I helped make about 20 yrs ago for one of the churches I work in. 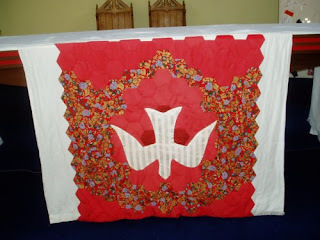 This altar frontal is made out of patchwork and the dove is actually the material that my wedding dress was made out of ......yrs ago. The floral material came from a dress that I wore in the early 1980's when Princess Diana and her attention to frills on clothes were associated with the latest fashion trend. Today, as I have already said, in the previous post is Pentecost Sunday and this evening we welcomed the Bishop of Winchester to one of our churches for the service of Evensong. The Bishop of Winchester is one of the highest bishops of the country and he preached about his experience of visiting the Congo and meeting people who spoke different languages but worshipped the same God. This was also a service when people from churches of other denominations were also invited, it was truly a memorable evening in a little country church on a warm Summers evening. My garden has just started to get it's Summer clothes on, the Spring flowers have disappeared for another year and the young annual plants are trying to make their way into the world. But there is a certain pest that I'm having a battle with at the moment as it keeps eating whatever tender young plants it sees. Yes its the slug! I've tried slug pellets, now I'm attempting to get them high on coffee. Apparently slugs actually "froth" after eating their fill of caffeine which acts as a stimulant even to these little creatures and they slither away on a high! So I just tip the dregs out of my cafetiere onto the garden where the young plants are and "hey presto" the slugs then have their cuppa! There are other methods of reducing slugs, such as filling a container and sinking it in the ground filled with beer, but I think that's a waste of good beer! As you can see Sid the Scintillating Slug is slinking by the watering can and a few butterflies fly overhead, all designed by Jane. I did go a bit wrong with this watering can, which is why I found it buried amongst some other odd bits of tatting, that I just couldn't throw away! 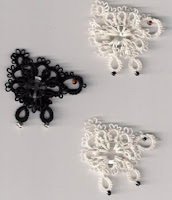 Talking about odd bits of tatting, I also found, what is supposed to be a dove amongst my bits and pieces. I originally designed and made a few of these doves for some confirmation cards, but didn't really think that the result was good enough, so as tomorrow is Pentecost Sunday I've added a few tongues of fire! 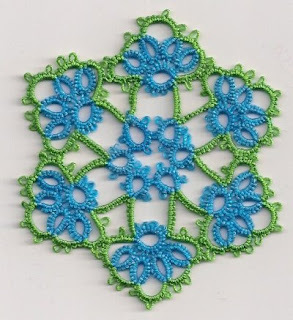 Well I managed to finish this piece of tatting, it took much longer than I expected and I'm seriously bored with the pattern now, but the result was well worth the effort. When I visited my sister the other weekend the last thing she handed to me on her front door step, before we sped off in the car, was a bag, no not one of her handmade bags, a plastic shopping bag! In the bag were lots of reels of tatting cotton that she did not want anymore, you see Jane is having a clear out ready for when she buys the Lizabeth cottons. So I could not wait to use them and this piece is the result, the colours are so vibrant don’t you think?! That's the name of this design by Majorie Hanson and it just reminded me of the Annual Chelsea Flower Show which comes to an end tomorrow. Each year the Royal Horticultural Society holds this magnificant show, with gardens planted just for 6 days in the middle of London. Royality visit the show before it is officially opened and thousands of people view the beautiful displays, often showing for the first time new varieties of plants. This year there was even a Credit Crunch Garden! Within the next week you will see this Summer Posy grow into a lovely floral display. 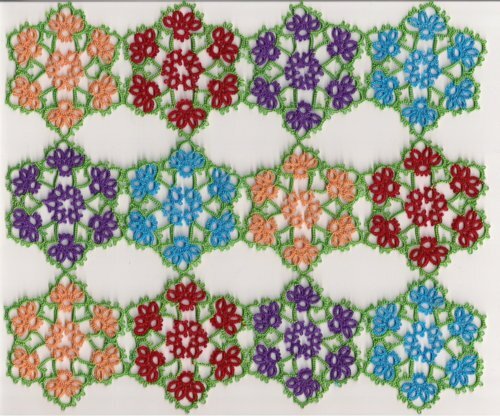 I really enjoyed tatting with Jane's MOP button patterns, well one in particular! These are some of the results, a few of the brooches were given away over Easter. When I wore the black and red one on a jacket, one person thought it looked like a spider! Someone else said it was very unusual and very pretty, I took that more as a compliment. Actually I had to stop making them it was getting an obsession, a bit like when I started, and just couldn't stop, tatting around Christmas baubles, opps still haven't written that pattern down, but will before December. On our way back home yesterday after visiting family for the weekend, we called in to see my my sister-in-law who is currently "house sitting" and very often, at the same time, has to look after the owners animals. At present she is in a lovely house with two dogs, and has the responsibility of two sheep and 12 lambs. 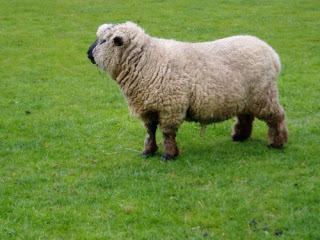 Here is one of the sheep, and notice he has still got his winter coat on. Unfortunately I wasn't able to take any photographs of the lambs as the heaven's opened and the rain came down. These sheep are a rare breed and are particularly reared for their fleece. The nursery rhyme Little Bo Peep just came to my mind whilst thinking about looking after these sheep, although I hope she doesn't loose any! Little Bo Peep was derived from the deriative of the words bleat and sheep! I decided that the owner of the house, currently abroad, would appreciate (lets hope!) a couple of tatted button lambs, so I duly left the white ones with my sister-in-law. Of course I still have the black, the grey and the rainbow sheep. Jane and I had a "tat chat" and she gave me a lesson on how to cover a wire choker, and kindly took some photos for me for future posts. When I was growing up most homes possessed a "button tin" in which spare buttons, or buttons cut off garments were stored. In the last week I have been given two such tins, no longer required by their owners. The tins were passed on to me to see if they contained any useful buttons. 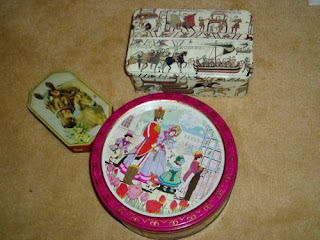 In the picture is a very old "Quality Street" sweet tin and "Blue Bird" toffee tin, both probably over 50 yrs old. The other tin is my own button tin, its age is about 18 yrs ago. On the front is a picture of a section of the Bayeux Tapestry which is housed in France and tells the story of William the Conqueror's invasion of England through pictorial panels. Although it isn't tapestry at all! It is embroidery, using coloured wool, on 8 long strips of bleached linen which have been stitched together to form a continuous panel about 20 inches high and 230 feet long. It was probably made in the 11th century. There is a Victorian replica of the tapestry housed in Reading, England. Well I'm off to see my sister Jane this weekend and have a "Tat-Chat" and if by then she hasn't told you what she is designing I'll "spill the beans" when I get back!!! Now I probably own too many handbags, and whenever I decide to change one for another, to go with a particular outfit, then a multitude of bits and bobs has to be transfered. 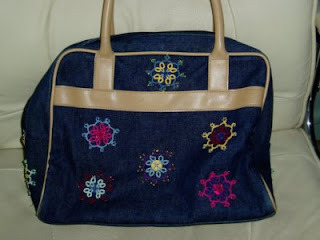 This is one of my favourite bags, I attached the tatting a few years ago now and it livened the bag up no end! Yes I know its buttons again. Well I'm afraid you haven't seen the last of them. 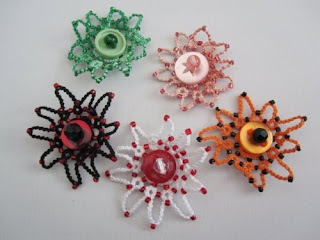 I like working with beads and buttons, they add depth and interest to a piece of tatting. There are so many tatted heart patterns, but this particular one I thought was a bit different. 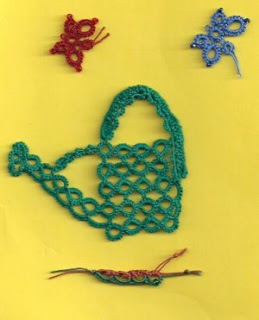 It is called Abby's Heart and was originally designed by Ann-Christine Sundqvist of Sweden (her first original design). I have altered it slightly though adding beads and note the fancy bit on the bottom! I would like to make more of these hearts but although I have quite a few buttons, trying to find three exactly the same is proving difficult! It seems Britain could face a critical shortage of professional sheep shearers this year, they usually arrive from Australia and New Zealand in May to give a short back and sides to 200 sheep a day. The dearth of shearers is blamed on British government immigration red tape. The would-be shearers must go to Canberra for fingerprinting, and visas are delayed. All this could mean losses for the farmers and disease for poor unshorn sheep. However, I doubt anyone would want to shear the poor rainbow sheep! Mark that's your sheep. Just before Easter Carol Lawecki quoted the nursery rhyme "Mary had a little lamb" and tatted some lambs and of course Mary, which were all absolutely delightful. This Sunday is known as Good Shepherd Sunday, or Vocations Sunday and we are still celebrating Easter in church. I was so impressed with the little lambs I saw on Carol's site that I decided to tat some and as you see have included a black one. However, I've discovered that in some places saying "Baa Baa Black Sheep" isn't politically correct, and the rhyme has been changed to "Baa Baa Rainbow Sheep" - has the world gone that crazy?! 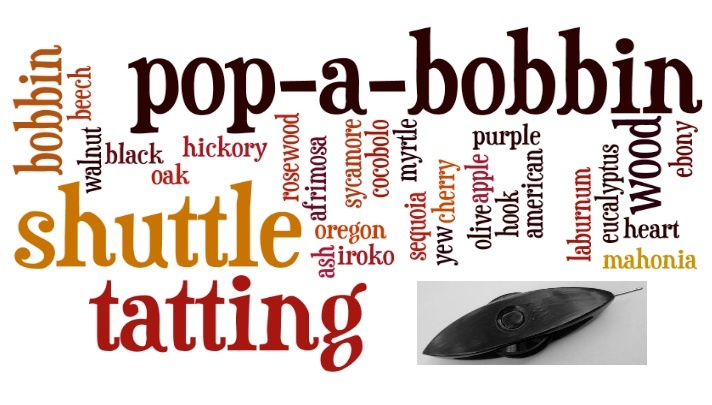 The history of this rhyme goes back to the 13th Century. It relates to a tax imposed by the King on wool. One third went to the local Lord (the master) one-third to the Church (referred to as the Dame) and a third was for the farmer (who lives down the lane). I have also found two more verses to the rhyme which have obviously been added recently, so I wonder if they have solved the problem about political correctness? Thanks to Martha Ess for the pattern and big sis for the link on her blog. It's May Day! When in England we hear the sound of a cuckoo, it means that Spring is on its way, or some may even say Summer. The only cuckoo I've heard this year, so far, is the one that pops his head out of the "cuckoo clock" and is banned to the garage because of the noise! A few years ago we kept a cockatiel and his name was Popeye because he ate spinach. Sadly Popeye is no longer with us, but before he passed away I created a replica of him in tatting, this was the result. 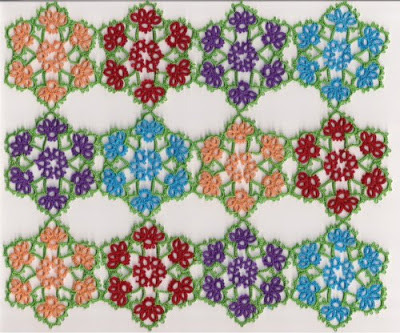 It was adapted from a multicoloured parrot pattern published in the ROT book "Tatting 2000" amazingly written by a lady named Mary Parrott.